Born on April 16, 1947 at the station Semeykino Lugansk region, the USSR. From 1969 to 1974 studied at the Moscow State Institute of International Relations of the USSR Ministry of Foreign Affairs, specialty – journalism. From 1981 to 1991 worked in the editorial office of the newspaper “At the fighting post”, from 1991 to 1992 – in the newspaper “Boss” (first as an artist, then executive secretary), then associate executive secretary in the newspaper “Private Life”, then the first associate executive secretary in the newspaper “Antenna”. 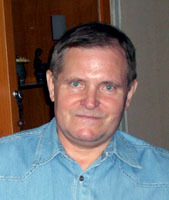 In 1995-2002 was executive secretary in the newspapers “Paseka” and “Paseka of Russia”. In 2002-2004 was a special correspondent in the newspaper “Our Life”. Since 2005 worked as an executive secretary, deputy chief editor of the newspaper “Moscow North”. The first cartoon was published in 1976 in the newspaper “Trud”. He contributed to the magazines “Crocodile”, “Change”, “Spark”, “Soviet Union”, “Fatherland”, in the newspapers: “Literary Gazette”, “Trud”, “Pravda”, “Izvestia”, “Moscow News”, “Komsomolskaya Pravda” and others (almost all Moscow papers). Also — the magazines “Peretz”, “Chayan”, “Vozhik”, “Kiperush”. Also published in the US, Japan, Germany. Participant of more than 15 all-Union, international, domestic cartoon contests. Three times prize-winner of cartoon contests by the newspaper “Trud”, prize-winner of the caricature competitions by the newspapers “Soviet patriot”, “Inventor and rationalizer”, “Workers ‘and peasants’ correspondent”. In recent years worked as deputy chief editor of the newspaper “Moscow North”. A member of the Committee of graphic artist of Moscow and the Union of Journalists of the USSR.